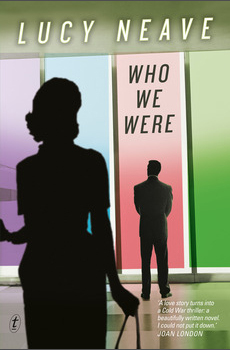 Who We Were is Lucy Neave’s first novel, published by Text Publishing (Melbourne) in May 2013. It is 1938, and Annabel’s dream is to be a scientist. Falling in love is not part of her plan. But when she meets Bill Whitton, a medical student, she believes that they are destined for each other. She has to wait for him to come back from the war. Then, the newlyweds emigrate to New York. They are at once captivated by fellow immigrants Frank, an ex-Communist from Hungary, and his playwright wife, Suzy. It’s the 1950s and the Cold War is in full swing. Frank, Annabel and Bill find work on weapons projects, experimenting with lethal infectious diseases. Who We Were emerged from a long process of writing and re-writing. As a veterinary student, I took part in a Cornell Leadership Program for veterinary students interested in scientific research. As part of this program, I visited the United States Army Medical Research Institute in Infectious Diseases in Maryland, where biological weapons research was carried out during the Cold War. I was interested in how it affected scientists to be engaged in weapons projects: how they dealt with the ethics of their work. The experience of visiting the labs gave rise to the idea for the novel, but the writing of the book involved extensive research into Cold War-era American society, the persecution of suspected communists and infectious disease research. Alongside reading histories about the time, I had to work out who my characters were and their story: whether their love for each other could withstand their doubts about their work and the atmosphere of the time. Listen to an interview with Lucy Neave about Who We Were (Zed Book club). Buy the book through the Text Publishing website (with links to online booksellers) here. Or, purchase it from your local independent bookseller.